In order to design or numerically simulate the behaviour of unreinforced masonry structures it is necessary to obtain detailed information about the material behaviour at the micro and macro level. This means that it is necessary to understand the behaviour of the masonry units, the mortar joints and the unit/mortar interface under tension, compression, bending and shear. Furthermore, it is necessary to have information about the full range of behaviour from linear elastic, through cracking and softening to post softening behaviour. This project represents a collection of work over several years which has implemented existing, and developed new, carefully controlled experiments to accurately measure masonry material behaviour. The project includes investigations of masonry behaviour under direct tension and direct compression, the flexural behaviour of masonry in vertical bending, horizontal bending and two way bending, the shear behaviour of mortar joints, and the behaviour of wall ties in cavity and veneer construction. Heffler, L.M., M.G. Stewart, M.J. Masia and M.R.S. Correa (2008). Statistical analysis and spatial correlation of flexural bond strength for masonry walls: Journal of the International Masonry Society Masonry International, Vol. 21, No. 2, 2008, pp. 59-70. Masia, M.J., Y. Han and M.R.S. Correa (2006). 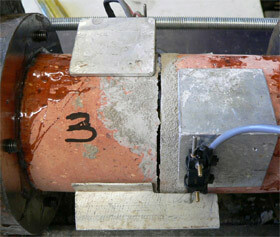 Torsion testing for the characterisation of the shear behaviour of mortar joints in masonry. Journal of the British Masonry Society Masonry International, Vol. 19, No. 2, 2006, pp. 77-88. Correa, M.R.S., A.W. Page, Y. Han and M.J. Masia (2006). Experimental and Theoretical Study of the Shear Behaviour of URM Walls with Openings. Journal of the British Masonry Society Masonry International Vol. 19, No. 1, 2006, pp. 1-14. Correa, M.R.S., L.M. Heffler, M.J. Masia and M.G. Stewart (2008). Flexural bond strength for masonry walls: An experimental and statistical analysis. Proceedings of the 8th International Seminar on Structural Masonry, Istanbul, 5-7 Nov 2008. Submitted April 2008, Accepted 2 June 2008. Heffler, L.M., M.G. Stewart, M.J. Masia and M.R.S. Correa (2008). Spatial correlation of flexural bond strength for masonry walls: An experimental and statistical study. Proceedings of the 14th International Brick and Block Masonry Conference, Sydney, Australia, February 17-20, 2008. Page, A.W., G. Simundic and M.J. Masia (2007). Wall tie behaviour in cavity and veneer wall systems (A preliminary investigation). Proceedings of the 10th North American Masonry Conference, St. Louis, Missouri, USA, June 3-6, 2007, pp. 323-334. Masia, M.J., Y. Han, C.J. Player, M.R.S. Correa and A.W. Page (2007). Torsion shear test for mortar joints in masonry: preliminary experimental results. Proceedings of the 10th North American Masonry Conference, St. Louis, Missouri, USA, June 3-6, 2007, pp. 968-979. Han, Y., M.J. Masia, S.J. Lawrence and A.W. Page (2006). 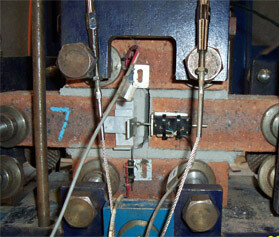 Experimental study of four brick unit specimens subjected to bending. Proceedings of the 7th International Masonry Conference, London, UK, 30 Oct – 1 Nov, 2006. Masia, M.J., Y. Han and M.R.S. Correa (2006). Torsion shear test for mortar joints in masonry. Proceedings of the 7th International Masonry Conference, London, UK, 30 Oct – 1 Nov, 2006. Han, Y., M.J. Masia, S.J. Lawrence and A.W. Page (2005). Preliminary finite element modelling of four brick unit specimens subjected to bending. Proceedings of the 10th Canadian Masonry Symposium, Banff, Alberta, June 8-12, 2005. Han, Y. and M.J. Masia (2004). A 3D non-linear finite element model of brick specimens subjected to bending. Proc. of 7th Australasian Masonry Conference, Newcastle, Australia, July 13-16, 2004, pp. 446-455. Masia, M.J., Y. Han, S.J. Lawrence and A.W. Page (2004). An experimental study of brick masonry specimens subjected to biaxial bending. Proc. of 13th International Brick and Block Masonry Conference, Amsterdam, Netherlands, July 4-7, 2004.